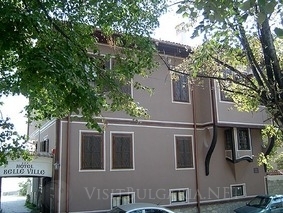 Belle Ville Hotel in Plovdiv City in Bulgaria. Location: The hotel is located in the centre of the Old Town. The hotel is an authentic house from the Renaissance period, entirely renovated in original style. The building is a national monument of culture. It has a fascinating facade and a romantic yard, where an original wall is located, together with many flowers and plants. Accommodation: Hotel Belle Ville offers 8 rooms. Wine and Dine: Guests of the hotel may have their breakfast and dinner in the hotel restaurant. It accommodates 60 people and 60 more seats are outside in the garden, under the branches of the fig tree and the wide plantation. Buffet breakfast is served in the comfortable, inviting restaurant. Sample a wide variety of dishes including Bulgarian and European meals and salads, desserts, alcoholic and soft beverages.